After Crystal Palace’s defeat yesterday at home to Manchester City, Newcastle are now just 4 points off 11th place with four games to go and only one point behind Palace. If we can win three of those games, we could have a chance to finish 11th, but it will be difficult. We are 10 points clear of relegation and 11 if you include our decent goal difference – so we should be safe for this season. Rafa Benitez showed his class and skill by getting us an unexpected win at Leicester City on Friday night, so hopefully, we can keep the winning streak going, at home to Southampton on Saturday. Captain Jamaal Lascelles has been interviewed in the Chronicle and thinks we have proved people wrong again this season after starting our first 10 games without a win and getting only three draws. Jamaal is right – we have done well given the money invested by the owner, but fans and Rafa don’t want to be proving pundits wrong every season by just avoiding relegation. We want to be challenging for a top eight and then a top six position with the possibility of winning trophies. That could be possible if Rafa stays on Tyneside, but it’s like pulling teeth trying to get any support from the owner. There’s no guarantee if Rafa stays we’ll do too much better next season. We have four games left. Every one of those game is winnable so we are hoping we can have a good run-in to the season and beat last season’s points total of 44 points. We need 7 points from those four games. 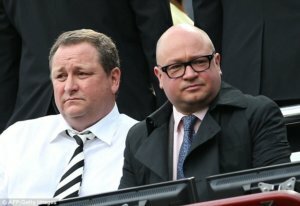 Haway Ashley man, Stop hiding in the USA, Hasn’t Rafa done more than enough to prove to you that he can and WILL do the job without wasting time and MONEY on shite signings ? He just wants to know that you will back him, if and when he needs it. Also the facilities are below par not to mention SJP. That is so tatty and lacks maintenance especially in the corporate areas even though you are still charging hefty prices. Pay attention and take a good look around you will easily spot what I mean. Take pride in your top earner, After all you have made a hell of a lot of money from it.